Spurthi Mahila Mandal is one of the popular organizations in Karnataka working for the empowerment of women. The Spurthi Mahila Mandal is very much active in the Bijapur area of north Karnataka and the activities of the organization could cause a deep impact on the living standard of women in the society. United efforts of the Spurthi Mahila Mandal members in Bijapur in conserving the women’s rights were successful so far and they are still engaged in their activities for the effective management of Natural Resources and safety of children. World Vision India is an internationally established Christian humanitarian organization working with the intention of helping children and families in India suffering poverty and injustice. The organization helps the people regardless of their religion, color, caste, gender, or race. The organization has their presence in more than 170 districts in India, including the district of Bijapur in north Karnataka. World Vision India activities also include immediate disaster relief assistance and conservation of children. They want every child in the locality to be educated, healthy and protected. Vidya Poshak is one of the registered nongovernmental organizations in India working for the development of education field. The Vidya Poshak organization was started at Dharwad in the year of 2001 by a group of people who were interested in contributing to the educational development of the country. The organization supports the financially backward bright student in different states of India. Vidya Poshak organization is active with their education promoting activities in the Bijapur district of Karnataka. Graduate Finishing School, Nurture Merit, School Leadership Development Program and Centre for Development of Soft Skills are some of the famous projects of the organization in India. The Kanarese North side Gramin and Krushi Vikasvardhak Association is one of the registered associations in Karnataka promoting agriculture. The organization was registered under the Karnataka Societies Registration Act 1960 and started operating in the year of 2010. This organization is active in all the districts of Karnataka state and it has introduced considerable changes in the agricultural sector of the Karnataka state. The Kanarese North side Gramin and Krushi Vikasvardhak Association in the Bijapur locality have been initiated many rural development programs and agriculture promotion programs. The Bijapur Liberal District Educational Association, which is commonly called in the name BLDEA, is a charitable trust operating in the educational field of Bijapur district in Karnataka. The association established in the year of 1910, before India’s independence is one of the oldest organizations still acting in the Bijapur locality. This organization presently run about 75 educational institutions in Karnataka and offer varieties of courses including degree course in engineering, medicine, commerce and science. New society for women is an NGO working in the Bijapur city since the year of 1993. This organization has raised their voice against the civic issues and human rights violations in the city of Bijapur. They are also active in the field of women empowerment, and promotion of Education & Literacy. The new society for women has their presence in the neighbouring districts like Bagalkot, Belgaum, Bellary, Bidar, and Gulbarga. The Vivekanand Janaseva Vidya Kendra is a registered organization working for the social development in Bijapur since the year of 1984. 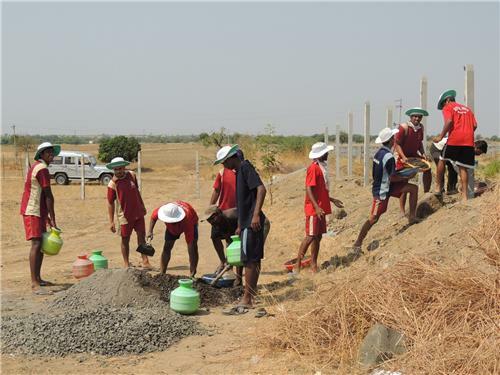 They have contributed their efforts for the development of agriculture, education, and facilities in Bijapur. The Shimmer urban and rural development association is one of the major organizations functioning in the Bijapur location for the encouragement of Animal Husbandry in Bijapur. Their efforts were also helpful for the uplifting of the Sports, Science, and Technology in Bijapur. Kala Chetan Yuva Samsthe is one of the popular associations of the youth in the Bijapur district. Their activities are mainly on the fields of Agriculture, Art & Culture, Disaster Management, Education & Literacy, Environmental issues, and Employment in Bijapur. Nirmal Women and Child Development Society started working in the year of 2004 in Bijapur. The organization is active in Bagalkot, Bidar, and Gulbarga districts located close to Bijapur. The field of activities of the Nirmal Women and Child Development Society also include Health & Family Welfare, HIV/AIDS, Minority Issues, Women's Development & Empowerment, Human Rights and Urban Development. The Image Educational and Literary Cultural Social Welfare Association in Bijapur is one of the newest organizations operating in Karnataka state for the promotion of literacy and education. This organization was registered in the year of 2008 in Bijapur and started to spread awareness about the necessity of education and women empowerment among the people. Bijapur District Physically Handicapped Welfare Association runs many vocational Training centers, High schools and Employment Information centers in Bijapur for the Handicapped. It has an aim of providing better education to the Handicapped students in the locality. Elixir Association is a nongovernmental organization working in the Bijapur district. The organization was registered and started to function in the year of 2010. Agriculture, Art & Culture, Children, Education & Literacy, Drinking Water and Poverty Alleviation are the major fields of operation of Elixir Association.